The Trinamul Congress has suffered a jolt in the hills with the Jana Andolan Party rejecting an oblique offer by the ruling party for an alliance to fight coming municipal elections. Aroop Biswas, the Trinamul Congress observer for the Darjeeling hills, said yesterday that his party "will give a call for all to come together" in the hills. "I have repeatedly been saying we want the hills to be beautiful, there should be development and the hill people should be happy. For that, we will give a call for all to come together," Biswas said, when told about the JAP's announcement to go it alone in the municipal polls in the hills. The JAP president, Harka Bahadur Chhetri, when told about Biswas's call for a united effort to bring happiness to the hills, however, said the statement was not in consonance with the functioning of the ruling party's grassroots leaders. "Maybe, he (Biswas) has not been properly briefed. But there cannot be a tie-up when you hit back at your ally. The functioning of Trinamul leaders at the ground level is not acceptable. You don't hit your ally. At the moment, our party is in the mood to go it alone," Chhetri told The Telegraph over the phone from Kalimpong. In the last Assembly elections, Trinamul, JAP and the GNLF had come together to forge an anti-Gorkha Janmukti Morcha alliance. The tie-up ensured that the Morcha's victory margin went down by 68 per cent in three hill seats, compared to the mandate Bimal Gurung's party had received in the 2011 Assembly polls. Although Chhetri today said the JAP was in no mood to go for a tie-up in the civic elections, he said unfolding circumstances would direct the future course of action. "The JAP is for Gorkhaland and this will decide our future course of action. Trinamul is against statehood, while the GNLF is for Sixth Schedule (status for the hills). 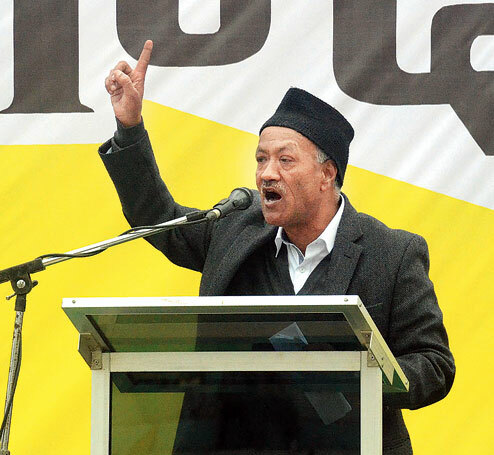 We are, however, for statehood," said Chhetri.